We also check your firewall and security settings, etc. In-shop virus removal is the most cost effective option for this service. However, if being without your computer for a few hours affects your productivity; on-site virus removal may be more convenient for you. If it pops up out of nowhere, don’t buy it! That is a safe rule of thumb when it comes to fake virus removal software. Online scam artists often try to get people to buy fake “virus removal” software that is actually malicious. Random and unusual “virus scan” pop ups are usually associated with fake virus removal software. So don’t buy it! It’s better to take your computer to a computer repair expert in your local area, or bring it to us, if you live in or near Vancouver, WA. Getting virus removal software online when your computer is already infected can be risky unless you know what you’re doing. When you have a computer that’s infected by viruses and Spyware, we recommend virus removal as soon as possible. 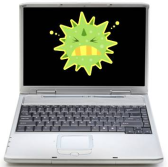 If left on a computer for too long, viruses can cause further damage to your computer. This leads to expensive computer repairs. Spyware puts your privacy and personal information at risk. Refrain from doing any online banking and other similar activities until you get virus removal service. The turn around time for our virus removal computer repair service is usually about an hour. However, in some cases, malicious software like the infamous Trojan horses can delete or hide data files. So we may need to recover the hidden or deleted files in addition to the virus removal service. We have experience dealing with such computer problems; so we generally can get your computer fixed within 24 hrs.